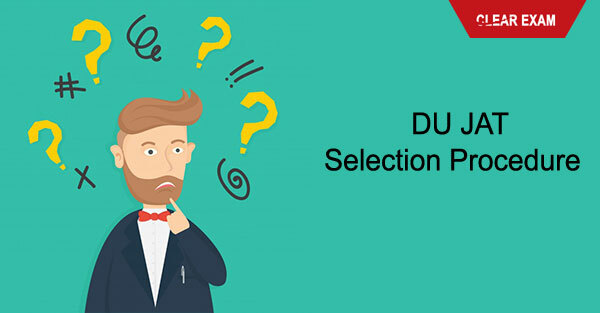 The DU JAT 2018 selection procedure is to select the most suitable candidate for admission to BBA (FIA), BMS and BA (H) Business Economics programmes. Candidates who wish to get their selection in DU JAT Exam have to score marks as per the cut-off. DU JAT Entrance Exam is conducted annually by Delhi University. The selection process varies for different colleges and exams. Candidates will be selected on the basis of their performance in DU JAT and Class XII board exam. As we have discussed above, a candidate's selection in DU JAT Exam is dependant on three factor i.e. performance in DU JAT entrance Exam and Class XII Performance. Delhi University has given the following weightage to the DU JAT Selection Parameter. Selection of course and college - Once a student has fulfilled the eligibility criteria and cleared the exam, GD and PI and checked that their name is there in the merit list then he or she will have to visit the Delhi University for course and college selection which will be finalized there itself and no changes will be entertained after the course and college have been selected. Students will be given a choice between 6 colleges which are affiliated to the Delhi University and which accept the scores of the DU JAT BMS. Also, students will be asked to choose between three courses BBA Hons, BBA (FIA), and BMS. While in BBA Hons. the scores of qualifying and entrance exam are both given 50% weightage but in BBA (FIA) and BMS 50% weightage is for the entrance exam, 30% for qualifying or grade XII exam and 10% each to GD and PI. Document Verification - Documents that one needs to carry along with himself/herself are the admit card, a photocopy of the same and an attested photograph. Also, it is important to carry an attested copy of senior secondary mark sheet, an attested copy of confirmed results of grade XII mark sheet. If the student belongs to a reserved category then caste certificate is necessary. Class XII board certificate is to be carried while for Grade X mark sheet should be compulsorily carried. Character certificate document should be taken for the verification at the time of admission. Plus, school's transfer and migration certificate are important. These are all documents which need to be carried to the admission centre which is DU along with two attested photocopies of the same documents. Document verification and seat allocation are the last steps of the selection procedure.Once the written exam result is out for du jat, you should start preparing for Interview and Group Discussion. Getting an admission into Delhi University's affiliated college could be a great achievement in your career graph. Keep Visiting us for regular updates on DU JAT Entrance Exam details.